Kibbeh is a Middle Eastern type of meatloaf. It is usually made of bulgur, minced onions and minced red meat, but this version calls soy meat (meatless beef, from Trader Joe’s) instead of the red meat. 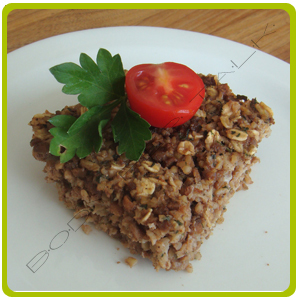 Besides being exotic and delicious, it is also a nutritious dish, since it is made with bulgur (instead of bread crumbs). Eating local produce that is in season is not only good for the environment; it is also good for you. By choosing to purchase fruits and vegetables that are in season you get fresh produce that is at its peak and have a better taste. In addition, products in season are usually cheaper. October brings us apples, cranberries, grapes, pumpkins, winter squashes, and sweet potatoes. Sweet Potatoes are a great alternative to regular potatoes. They are rich in vitamins A and C, manganese, and phytochemicals. They are also a good source of fiber and potassium. Despite their sweet taste, sweet potatoes are low in calories. 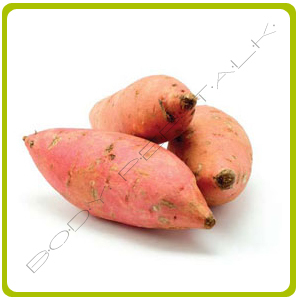 Plus, sweet potatoes have a low glycemic index, meaning that they won’t cause a spike in blood sugar. In a large pan, put a splash of oil and a tablespoon of grated ginger. Cook it until fragrant (about 30 seconds). Then, add 1 cup of shredded vegetables (I use broccoli stalks, carrots and purple cabbage), 2 tablespoons of soy sauce (low-sodium is better), 1 tablespoon of rice vinegar, and 1 teaspoon of honey. Cook the veggies for a couple of minutes, stirring from time to time. Finally, add 1 cup of cooked barley, mixing well. Sprinkle a handful of crushed cashew nuts and serve with a protein source of your choice. 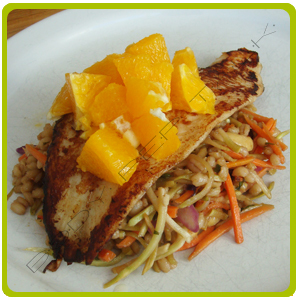 I like it with sautéed fish and fresh oranges, but it also goes well with shrimp, chicken breast and pork tenderloin. Yield two servings. It is fact that to achieve weight-loss, one must make dietary changes. The options are vast when it comes to diet, but the real important factor is to consume less calories than you burn. In order to reduce caloric intake, many people reach for meal replacement options available at grocery/health food stores. But are they effective? According to a recent study, even one portion-controlled meal replacement per day reduces daily caloric intake significantly and may lead to weight-loss in the long run. With the current news about inorganic arsenic found in rice and rice products, many of you may be looking for healthy alternatives that combine nutrition and flavor. If so, I’d suggest you try barley. Barley is a grain that has a nutty flavor similar to brown rice. It is a great source of fiber and protein, low in fat and cholesterol free. It also provides many vitamins, minerals, antioxidants, and phytochemicals. In addition, barley has a low Glycemic Index (GI), which means that it is digested slowly, thus not causing a spike in blood sugar levels. But beware! Barley contains gluten, so if you have gluten sensitivity or celiac disease, you should discuss it with your health care provider before introducing it into your diet. For a whole grain alternative to brown rice, look for minimally processed varieties such as hulled or hulless barley. Pearl barley undergoes more processing, so it loses some of its nutritional content and is not considered to be a whole grain. 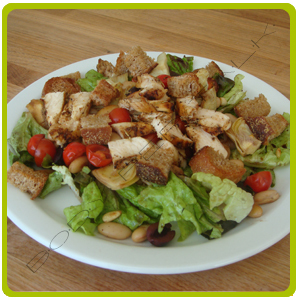 This is high-protein salad (from beans, chicken, and pine nuts), yet a light and fresh dish that can be enjoyed for lunch or dinner. It is also rich in fiber and antioxidants, while low in fat. This recipe yields a reasonable portion that will make you feel satisfied for hours. In addition, it is quick and easy to prepare. Here is an amazing idea for a quick breakfast or afternoon snack. This shake is a complete balanced meal with one serving of fruits, one serving of veggies, healthy fats, and protein. 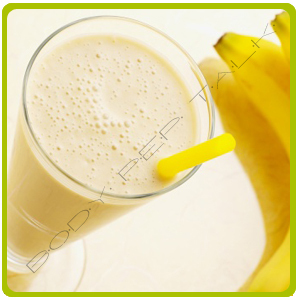 It is a thick and creamy smoothie which can satisfy your cravings for something sweet while filling you up. This recipe yields light fluffy pancakes with a nice crispy crust. For the batter, mix 1 cup of brown rice flour, 2 teaspoons of sugar, 1 teaspoon of baking powder, ½ teaspoon of baking soda, and a pinch of salt. In a separate bowl, combine 2 eggs with 1 cup of buttermilk. Add the egg mixture to the dry ingredients, whisking to combine. Makes four five-inch pancakes. 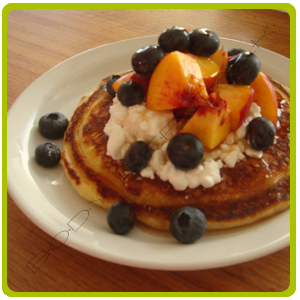 For a balanced breakfast, serve it with cottage cheese and fresh fruit, drizzled with a teaspoon of honey. 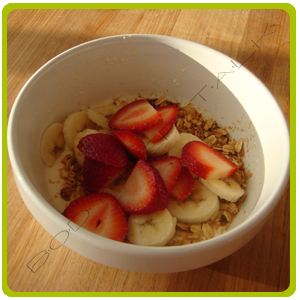 Here is another breakfast option under 300 calories. To keep calories at bay, go light on energy-dense ingredients such as granola and honey. Instead, indulge on bigger portions of fresh fruit, which provides lots of nutrients for just a few calories. Good options are strawberries, peaches, raspberries, blueberries, apples, and pears. These fruits have a very low calorie-density and can be consumed in satisfying portions. Varying your protein sources is as important as consuming a wide variety of fruits, vegetables, and whole grains. Legumes (such as beans and peas) and soy products offer a generous amount of protein for fewer calories. In addition, these foods also contain fiber and phytonutrients which are not found in animal products. 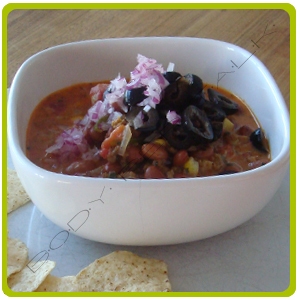 Give it a try and go meatless with this vegetarian chili recipe.